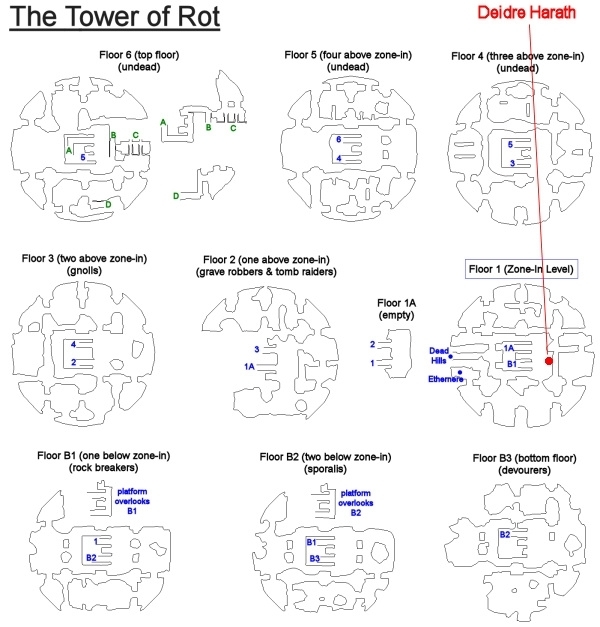 This group mission begins with Dedire Harath (click for map image) on the zone-in level of the Tower of Rot. - Completed "The Source of Rot"
Say "final attack" to request the task and "start" to zone in. - Hail Captain Deidre Harath at the zone-in. - Make your way down the ramp, killing the two tower scions on the way down. - DPS Fenn Tarrens to 25% health, then click on the blockade. --- Casts "Dagger Barrage" (60' range AE for 17K dmg). --- Casts "Tendon Slice" (negates dodge + avoidance). - Make your way to the bottom of the ramp, killing tower scions along the way. - Task LOCKS upon location update at Adana. - DPS Adana Baxter to 25% health. --- Casts "Splash of Acid" (single-target 6-second blind, cureable by sitting). --- Casts "Mana Scorch" (single-target dispell + mana burn up to 15K hp dmg). --- The scions behind her cast nukes on random targets (3k per nuke). --- These three scions become aggroable after Adana flees. - Make your way towards the heart, killing tower scions along the way. - Say "interruptions" to make Narius aggro. - DPS Narius to 50% health. --- Casts "Life Siphon" (dispellable lifetap effect). --- Casts "Wither" (increase incoming damage by 25% + DOT for 6,000/tick for 18 seconds). --- Adana and Fenn (non-aggroable at this time) cast their "Mana Scorch" and "Dagger Barrage" spells. - Once Narius reaches 50%, he goes non-aggro; Adana and Fenn attack. - Kill Adana and Fenn, after which Narius re-aggros. - Hail Captain Deidre Harath, who runs down to the entrance of the heart area after Narius' death. - Open the chest to complete. You have been assigned the task 'A Rotten Heart'. Captain Harath has asked you to investigate what the Scions of the Tower are doing in the basement of the Tower of Rot. Rumors say that there is some sort of monstrous heart down there and the cultists have been talking about it. She insists that the Scions need to be cleared out of the tower and that you should not spare them a moment's pity. She needs to know what they are up to down there. You have entered Tower of Rot: A Rotten Heart. "Mad Martyr" has a chance to spawn next to the entrance to the heart platform (you can't miss her). She casts "Bludgeoning" (69K frontal AE) + "Telekaria" (targeted 40' range AE for 93K dmg + 3-second stun) + "Fire Beam" (123K frontal AE). This step updates as you progress through the task. Just kill "a scion of the tower" as you come across them while moving through the zone. Fenn Tarrens casts "Dagger Barrage" (60' range AE for 17K dmg) and "Tendon Slice" (negates dodge and avoidance). Just click the table at the blockade. _____ pushes aside the table, opening a passage through the blockade. Find Adana Baxter at /loc 240, -140, -849 (bottom of the twisting ramp). TASK LOCKS upon the location update. She casts "Splash of Acid" (single-target blind, stun, nuke for 6 seconds) and "Mana Scorch" (single-target mana burn, up to 15K HP dmg). DPS her to 25% health to update this step. Note that the scions with her become aggroable after she flees. This updates at /loc 0, -45, -841 (just enter the platform area that houses the giant heart). Follow his dialogue to update the step ("interruptions" makes him go aggro). Narius casts "Life Siphon" (dispellable lifetap effect) and "Wither" (increase incoming damage by 25% + DOT for 6,000/tick for 18 seconds). Fenn Tarrens and Adana Baxter (non-aggroable at this time) uses their "Dagger Barrage" and "Mana Scorch" abilities, respectively. Adana and Fenn attack. Adana is leashed to her spot. Each of them starts at 40% health, so it won't take long to deal with them. Once they're dead, Narius re-aggro's, and can be killed. Narius Grandon has been slain by _____! After Narius is killed, Captain Deidre Harath will run down from the zone-in, so it may take a bit before you see her. She stops at the entrance to the heart platform. Captain Harath was grateful for your assistance. She thinks you might have prevented a great tragedy. The named, Mad Martyr, or its placeholder spawn immediately after completing the step "- DPS Adana Baxter to 25% health." - Invis and lev down to Fenn Tarrens. No need to kill any scions. - Invis and lev down to the bottom of the ramp. No need to kill any scions. - DPS Adana Baxter to 25% health. Adana is tethered to small area, but if you should be able to get her to slightly onto the ramp. If you do, when the 25% update happens, you are just outside agro range of the 3 scions, and also have a chance to invis to avoid their agro. If you have a pet class in group, they need to control their pet, or it will continue to attack after the update as Adana travels to the next location. - Mad Martyr or PH will spawn. Took me about 20 attempts to get Mad Martyr to spawn, but was very quick only having to kill two NPCs. Still freezes at Adana step. At what part of this encounter is she leashed to her spot? Still freezes after Adana stops fighting. Had to reboot. No collectibles. Didn't expect any but worth checking. My favorite mob of this instance: a dead undead. The last fight was a bit of a cluster---youknowwhat. The switch offs are confusing. We lost BOTH the mage and wiz, most of our dps, and still won. Thankfully the two dead casters got credit for the steps completed while they were in hovering mode. Have to admit this would have been much tougher back when this mission was first introduced. Level Uber Alles, as they say. Reward is puny: 2 AA's. You get an additional 4 for the Curative achievement, which I didn't even know we had, er....., achieved. And that's with LotD running at the completion. We won't be back! Absolutely no point to ever repeating this one. At the step mentioned in other posts where you beat Adana down to 25%, the task froze and all 4 players had to end the EQ session and log in again, the characters were stuck in the task, but once we had logged back in the task was progressible. Today it crashed on only 3 out of 4 toons. The three that crashed run on an AMD HD 7850. The one that did not crash is on Intel HD4000. Add Manifested Ether Helm to the mix. I also have the same experience as Tobynn with the Sanative sword and any armor drops, which always seem to be a bonus loot item. Actually had the sword, helm and a spell in addition to the one standard loot on my last run. The Sword of the Sanative seems to appear in the chest as a bonus item. Usually, the chest contains a single item only. However, on several occasions, I have cracked open the chest to find two items inside. On every occasion I have got two items, the Sword has always been in the second slot. As of 6/12/14 it is bugged with a freeze crash. 1st time only I crashed Second time all 3 accounts froze and crashed. Had to ctrl alt delete and reset. Confirmed. Immediately after defeating Adana Baxter for the first time all 3 accounts froze. My main account recovered while the other 2 did not and had to manually close and re login. I too can confirm this. I've done this mission a few times now and my entire group always freezes/crashes right at the 7th step: Defeat Adana Baxter. I have had to control+alt+delete and force shut down of EQ every time I run this mission. Mad Martyr can also drop the Shroud of the Forgotten. Three toons, three Mercs, one Aug loot. And zero collectables. Bloody Skull Pummel Chain 16 base dmg aug, 2h only. 114 AC, 2523 HP mana and end, slot 7 and 3. and of course all the other stats. So far seems to be 1 loot per chest, cheap. Charm, 114 AC, 2523 HP mana and end, all all but not list on what raises the stats, just shows max stats, so wonder if it is bugged. On a Side note, I wonder if the mission is bugged, few of us has a freeze crash bug, had to totally exit out of EQ and relog to continue.